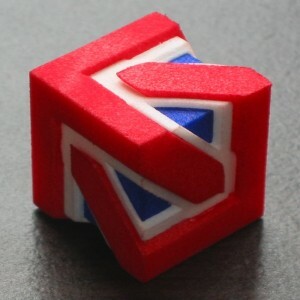 This entry was posted in blurb and tagged 3d-printing, boy's surface, geometry, math, rapid prototyping, shapeways, Trapped Outside, Union Jack Cube on 3rd April 2010 by admin. This entry was posted in blurb and tagged 3d, geometry on 25th September 2009 by admin. Lately I’ve been playing with rapid prototyping, also known as three-dimensional printing. 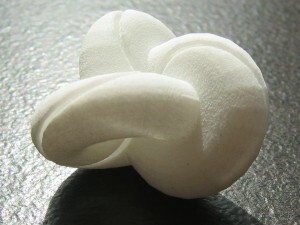 It’s a (relatively) new fabrication method that allows creation of shapes that would be impossible to create by moulding. It allows for creation of things like interlinked rings, objects trapped inside other objects, or complex voids. Shapeways, a Netherlands-based website, offers high-quality, relatively cheap rapid prototyping, and a place to host your own selection of models. As a website, Shapeways is no RedBubble — the interface and marketplace tools leave much to be desired. The ratings and sorting can be gamed, it’s trivial to figure out the markup on another user’s model from its price, there’s no way to replace a published model with an improved one, and the site has encoding and markup issues. But what’s a few flaws when you own the category? The free version of Google SketchUp has been satisfactory for rendering thus far, and its user interface is leaps and bounds ahead of the bizarre interface of Blender. I’m sure Blender has a superior feature set, but what good is power when you can’t figure out how to use it? Meshlab and AccuTrans3d have both come in handy for checking surfaces and converting between formats. On to the models! Click on the pictures to see more views of each. Trapped Outside is a model of Boy’s Surface with a sphere trapped in the space cut out by the one-sided surface. Boy’s Surface an immersion of the projective plane, which means it is a Möbius strip with a disk glued to its edge. It is a non-orientable surface with no edges and no pinch points. Trapped Outside was fairly easy to create using Google SketchUp. It’s just a few circles extruded along each other here and there. The Hollow Knotted Gear, inspired by Oskar van Deventer‘s Knotted Gear, consists of two interlinked knots; a trefoil knot (in green) and its dual, a 3,2 torus knot. The green trefoil forms a rectangular cross section and a triangular hole. The blue knot forms a triangular cross section and a rectangular hole. The two knots gear perfectly together, and can move around each other, but only if they are both moved simultaneously. After many failed attempts at getting various applications to render this complex extrusion properly, I wrote a small Python program to calculate the surface for me and output VRML. Then, after much more trial and error, I used AccuTrans3d via Wine to convert the VRML surface to a DAE file for uploading to Shapeways, and to a 3DS file for examining in Google Sketchup (and to take screenshots). There are a few more of my designs on Shapeways right now, and even more rattling around in my head just waiting to be prototyped. This entry was posted in essay and tagged 3-D, AccuTrans3D, art, Blender, boy's surface, dual, geometry, google, inside, knot, Knotted Gear, Meshlab, Möbius band, Möbius strip, Oskar van Deventer, outside, Projective plane, Python, rapid prototyping, render, shapeways, SketchUp, three-dimensional modeling, three-dimensional printing, topology, trefoil, trefoil knot, user interface, VRML, web design on 29th July 2009 by admin.